I have written about the many magnificent, serendipitous events that happen on my adventures, but I have never told you about the time that serendipity grabbed me by the throat and squeezed until I could barely breathe. It happened in a prison deep in the heart of the Loire Valley in France (Naturally. Aren't all good stories set in prisons in France? The Count of Monte Cristo, The Man in the Iron Mask, to name but a few). March 16, 2005 was a cold, damp, gloomy day. The kind of day that begs a body to stay inside, enveloped in a cashmere blanket, curled up in a comfy chair beside a roaring fireplace. It was the perfect day to hunker down with a good mystery novel or a moody movie, like the film noir classic, Laura, but, I was far from my cozy chair and stack of books. A few weeks before that dark and gloomy day in March, I had put the finishing touches on my fourth novel, Silence in the Mist, a historical novel based on the life of Françoise Després. The real Després had been a counter-revolutionary spy who had risked her life carrying secrets to aid in the counter-revolutionary movement during the French Revolution. Though she was deeply sympathetic to the aristocrats who were tormented, she was less concerned with the restoration of the monarchy and more concerned with the preservation of spirituality and the churches in France...but I digress. So, I had finished writing Silence in the Mist. I decided to book a trip to France to conduct research for my next novel. My plan was to drive from Paris through the Loire Valley, up to Brittany and Normandy, and then back to Paris. Along the way, I took notes for my next novel. Then, on that gloomy day in March, I visited a dank, spooky prison and serendipity reminded me of her power. I could bore you with a lot of details about the castle, like that it was constructed during the Norman period, has a standard square keep, is situated on a hill far above the river Indre, and was used as a prison for English soldiers during the American Revolution, but that would just bog you down in unnecessary details. 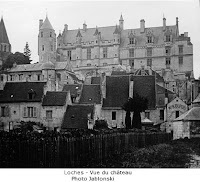 What you need to know is that the Loches I visited was super-creepy. I parked in the village nestled at the base of the hill upon which the castle is perched. Then, I walked through a maze of deserted streets, climbing higher and higher, until I finally reached the entrance to the castle. I paid my fee and began my tour at the inner-courtyard. At one time, the courtyard had been covered. Today, the roof is missing and a flock of pigeons have made their nests in what were once prison cells. Standing there in the rain, staring up at the empty cells, and listening to the multitude of pigeons cooing as if possessed, was rather chilling. Next, I toured the castle's torture museum and shuddered at a big box with spikes that had been used to skewer countless humans. I toured a few of the finer rooms and then made my way up the stone staircase to the top of the castle walls. After admiring the view of the town below, I made my way back down the staircase. ..there, carved on the wall of the Chateau de Loches, was the name FRANCOISE DESPRÉS. I do not know if the name on the wall was the same Francoise Després I had written about in Silence in the Mist, but I believe it was certainly possible. Francoise Després had been captured and imprisoned several times. During one of her imprisonments, she was tortured and even had her eye poked out. Some might say that I had read about Loches but had forgotten about it, pushed it to a back shelf of my subconscious, but I can promise you, until that trip to France, I had never heard of the place. 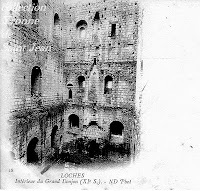 When I returned home, I poured through all of my research material but was unable to uncover even one reference to Loches. I believe something mystical, magical happened on that dreary day. I believe serendipity took me by the hand and lead me to that castle prison castle. I believe she caused me to stumble so that I might see Francoise Depres's name on the wall. Perhaps I am merely being wishful, but don't all serendipitous moments start with a wish? Ahhhh....serendipity. The wonderful friend who wanders into your life just when you need her the most. I hope you took her out for tea and maybe a pastry for giving you such a wonderful gift! Wonderful, as usual... but this one gave me chills! Chilling! I've had similar experiences with those spirit travellers. Your lady was gently nudging you to venture forth, perhaps, to notice what you've already seen. Ooooo... I loved this one! Thank you for sharing such an intimate & chilling moment with us!! This is a haunting blog. I can just imagine your reaction when you saw that name. Thank you for sharing.